Celtic Strings Trio are Anne Hamilton, vocals and guitar, Morag Sutherland (violin) and Jenny Blain (harp) and they play and sing a mixture of Celtic and modern music. Sakura have been playing together now for 2 years and meet regularly to play in Broughty Ferry, Dundee. The group consists of seven amateur classical guitar players who enjoy playing in an ensemble – Anne Hamilton, Eleanor Hind, Irene Kleppang, Joan McCulloch. Laura Monlezun, Peter Romilly and Qingzhong Liang. They chose the group name Sakura from the title of one of their favourite pieces – an arrangement by Garcia and Whitworth, of a Japanese piece meaning Cherry Blossom. They play an eclectic assortment of music from the Baroque, Classical and Modern periods and enjoy playing Argentinian and Brazilian folk music too. Tom and Kayren Hall, the husband and wife duo who make up SeaTangle, have been involved with music for over fifteen years in the East Neuk of Fife where they play regularly. They perform a wide range of music which includes traditional Scottish songs and tunes, and a wide variety of other songs gathered along the way. Tom, a valued member of the Wighton Singers, sings and plays guitar, drawing on a background which includes Sixties pop, amateur operatic shows, and also helping organise and run music sessions in the East Neuk, while Kayren plays fiddle and djembe. On Wednesday 5th December, at 1.15pm, the Wighton Singers will give their annual Christmas Lunchtime Recital. The Singers are now working regularly with renowned singer and teacher Amy Lord so we can expect to hear some wonderful harmonies and some very interesting songs and carols! Admission is free, donations as always are welcome, and Christmas treats will be available! On Wednesday 4th April, Simon Chadwick will play a lunchtime concert of Irish and Scottish harp music. Using the big Irish harp, he will show off some of his recent researches into traditional 18th and 19th century traditional harp style. The concert begins at 1.15pm and admission is free. 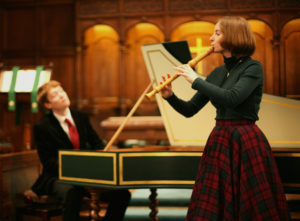 On Tuesday 10th April, we are very pleased to welcome Ensemble Hesperi to the Wighton Centre for a concert of harpsichord and recorder music. 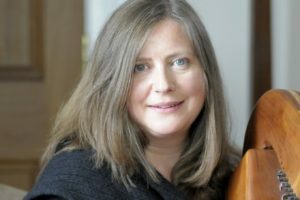 Mary-Jannet Leith plays recorders, and Thomas Allery will play the Wighton Harpsichord, for a half-hour programme of Scottish baroque music. The programme, titled “The Pheasant’s Eye”, will feature some of James Oswald’s “Airs for the Seasons” and William McGibbon’s “Collection of Scots Tunes” amongst other delights. Ensemble Hesperi is a young duo based in London. Mary-Jannet and Thomas have a particular interest in unpublished and previously undiscovered Scottish Baroque repertoire, and in exploring the fascinating links between Scotland, London, and the continent through Baroque music during the eighteenth century. Last minute change of plans for the 1st November lunchtime concert! Sylvia Crawford. Photo: M Ó Graham. Lorraine Wilson will now be doing the lunchtime concert on Wednesday 7th February 2018. Sylvia Crawford, from Armagh, has stepped in at short notice to play some tunes on harp and fiddle for us on Wednesday 1st November at 1.15pm. Sylvia teaches and plays fiddle, piano and historical Irish harp. 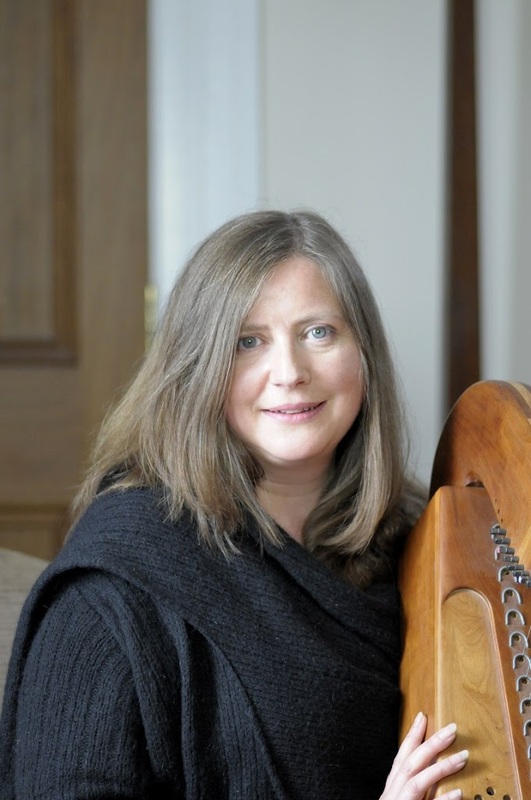 She is currently researching the music and traditions of an eighteenth century Irish harper and fiddler from Co. Armagh, Patrick Quin, and she will play some of his tunes on a copy of his harp. The concert is at 1.15pm on Wednesday, 1st November. Admission is free, and all are welcome. This is first chance for us to enjoy a performance from our own Simon Chadwick since he appeared in the BBC documentary “Scotland’s Treasures” and was nominated for the prestigious “Tutor of the Year” accolade at the Scots Trad Music Awards! 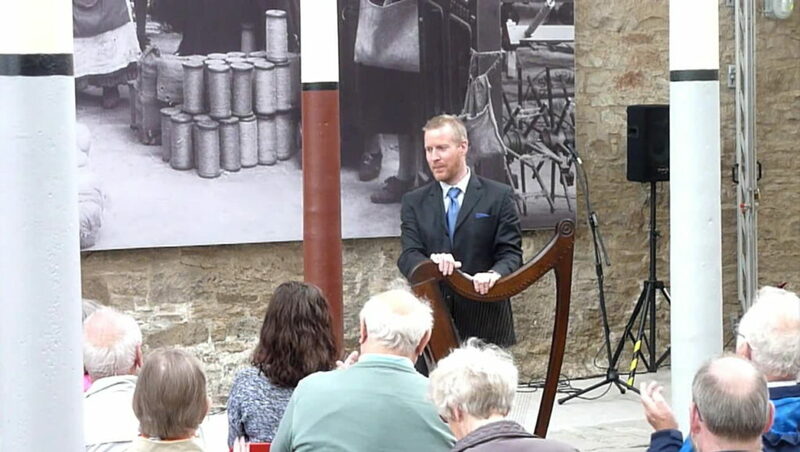 Simon will bring along the big Irish harp and will play a selection of traditional Scottish and Irish harp tunes found in the old music books from the Wighton Collection, from the baroque delights of Carolan to a West Highland pibroch. Simon has lived in Fife for 10 years now, and quickly became involved in the Scottish traditional music scene in Dundee with the Friends of Wighton. He had been interested in historical Scottish and Irish music before then, through his archaeological work on the ancient harp traditions. The concert is on Weds 1st March at 1.15 pm in the Wighton Centre, Dundee Central Library, DD1 1DB. Admission is free. Kyle Howie played a lovely lunchtime concert today in the Wighton Centre. Playing a very nice set of border pipes, he performed a selection of lively tunes and medleys, both traditional and very contemporary, as well as a fragment of pìobaireachd. On Wednesday lunchtime, historical harp specialist Simon Chadwick will present a quirky and provocative concert of “hot political tunes from three hundred years ago”. This elegant 18th century Scottish harp music addresses the pressing political issues of the early 1700s, with sweet sounds, melancholy jigs and startling anecdotes.